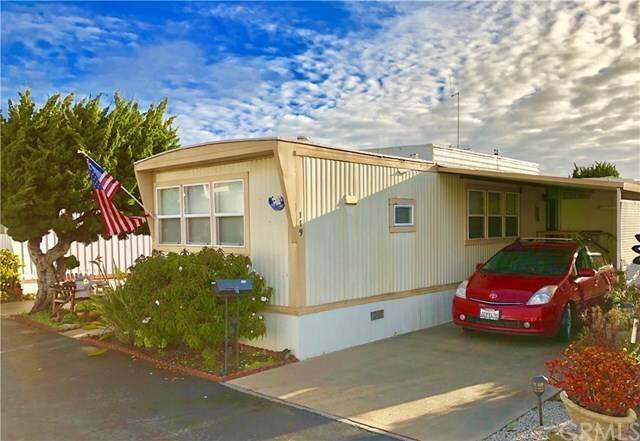 Cute Cottage look, manufactured home - close to the beach and other amenities. Stores, doctors, etc. are within walking distance, beach is very close too! This 1 bedroom, 1 bath home features new flooring, Maytag washer and dryer, and a wonderful outdoor space. Outside deck, nicely landscaped with plants. The home also has attached 1 car tandem carport & 1 shed, that stay with the property. Laundry and friendly Clubhouse, with events and a monthly community newsletter. Quality furniture included if required. Located in Grover Gardens Mobile Home Park - a 55+ community. New occupants are subject to park approval. Priced to sell.